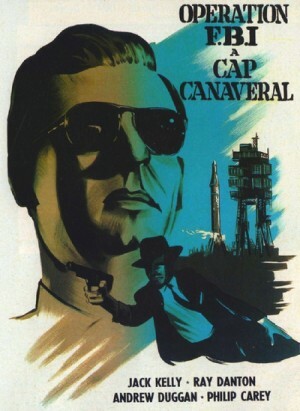 Robert Cannon (Jack Kelly), Fred Vitale (Ray Danton) and Alan Nichols (Andrew Duggan), three men vital to America’s missile program, are en route to Cape Canaveral when a bomb is discovered in a suitcase. Defused by Vitale, the device is turned over to the FBI, which takes charge of the investigation. Assigned to determine if it’s a case of sabotage or attempted murder, Inspector Leroy Gifford (Philip Carey) and his squad race to track down the bomber before he can strike again. Originally shot as a TV pilot, FBI Code 98 was based on a book by the film’s writer/producer, former police reporter Stanley Niss. Produced with the cooperation of the Federal Bureau of Investigation, FBI Code 98 was released in theaters instead, making its U.S. debut one year before Warner Bros. revisited the premise with the long-running TV series The F.B.I., which aired on ABC from 1965 to 1974.